KIEV, Ukraine -- The Ukrainian government continues to call its fight against the Russian invasion of the country “an anti-terrorist operation,” instead of declaring it to be a real war. Calling Russian actions a war, the Ukrainian military analyst says, is a matter of principle for “both the domestic and foreign understanding of this conflict,” and failure to use the right term gives Vladimir Putin and his much-hyped notion of “hybrid” war an undeserved advantage. “From the very beginning of this conflict,” he says, “the Ukrainian authorities have violated national law” which requires “the introduction of martial law” if Ukraine is invaded. But so far, the government has been unwilling or unable to take that legally required step, one entirely justified by what Russia has done. Repeated statements by senior officials that Ukraine would move in that direction “in the case of the intensification of the conflict” have not been followed by action. But Ukrainian society cannot be mobilized unless the government declares the existence of a state of war. 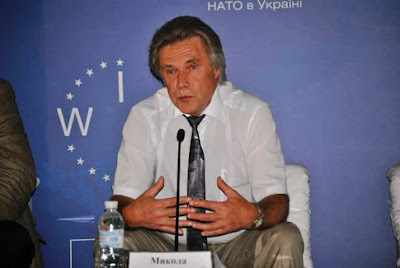 The Ukrainian government says it can’t take this step lest the IMF refuse to extend it credits, but the Kiev analyst points out that the IMF has not made such demands – and would be unlikely to if Ukraine declared martial law in one or another parts of the country or even for the country as a whole, given that Putin’s “hybrid” invasion touches the entire country.